Do you love an adventure? Then this Adventure Package is right up your alley! With the adventure package you may choose to see snakes, howl with wolves, and watch camels. The experience with our animals in our exquisite environments created to mirror their natural habitat will be something you will never forget. 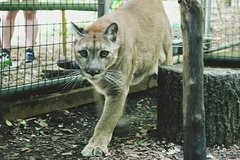 We are a zoo like no other and offer more options than a traditional zoo. Experience, for yourself, why our adventure package is exactly the experience you have always wanted. The adventure package allows you to enjoy a Wildlife Walk and enjoy the experience of viewing camels, reptiles and other animals in an environment which mirrors their natural habitat all within the walls of our wonderful zoo. You will also get to see exotic animals you only thought you would see on TV. • Wildlife Walk is a 45 min-1 hour guided tour to learn more about and get to see wild animals such as deer, kangaroos, lemurs, Fennec fox, snakes, alligators and more. • Camel Experience: For roughly 35 minutes you enjoy the friendly camels and see their personalities emerge as they naturally interact with each other. No spitting here! Take a wagon ride up to the ridge and view even more animals as your guide tells you all about them. Animals include: water buffalo, yak, highlander cows and camels!! • Reptile Experience: See our 150 lb Python, Giant Tortoise, 6ft Black Throat Monitor Alligators, intense crocodiles, tarantulas, giant frog, chameleons, dragons, iguanas and more! Dozens of reptiles, amphibians and bugs to view & learn about! Great for all ages.